This was originally an article written for Sport illustrated in 1957. It became a book which went on to become the largest selling golf instruction book ever written. Miss Tschetter was one of the very few to have had the great privilege to experienced Mr Hogan, the teacher. She shares her very unique and personal time she spent with Mr Hogan. This is a special book! This is a fun book that gives us interesting inside information. One of the best biographies written about Mr. Hogan. More than 100 years after his birth, more than 60 years after his Triple Crown in the majors, and more than 15 years after his death, Ben Hogan continues to be golf&apos;s all-time man of mystery and curiosity (although some would argue Tiger Woods has surpassed him). 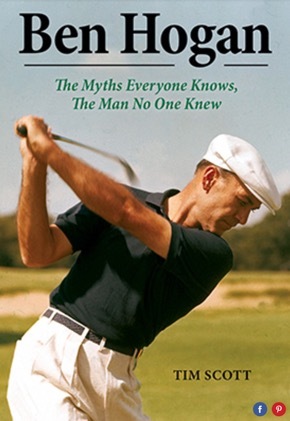 But based on two things -- his stoic, passive and hard exterior and the famous "secret" swing component he said he discovered that continues to be debated -- Hogan has been endlessly analyzed and dissected through books, articles, and TV documentaries. Modern teachers and tour pros, such as Jason Dufner, profess an allegiance to Hogan&apos;s swing method, and I count at least a half-dozen books in our collection that solely focus on the Hogan secret and swing. If you want the legend&apos;s swing thoughts straight from him, get a reissued copy of Power Golf or his classic Ben Hogan&apos;s Five Lessons, The Modern Fundamentals of Golf. Scott, however, is the latest to do a Hogan biography or profile, following such efforts from Gene Gregston, James Dodson, Curt Sampson, Martin Davis, Mike Towle and Kris Tschetter. In his new book, scheduled for release in April, Scott comes to his Hogan study from an up-close approach: He worked for the Ben Hogan Company/AMF from 1969 to 1982, including eight years as VP of sales and marketing. As such he had an active business relationship with the company&apos;s namesake (he confides he and Hogan were not tight socially), and the picture he paints of the iconic figure uses only black and white colors. For all the characteristics Hogan showed as an intimidating, distant, private and driven individual, Scott contrasts them with warm, cheerful and friendly behavior. Photography of Hogan cutting up or wearing a wig are somewhat shocking since he is normally seen expressionless on the golf course. Fitting in with the point/counterpoint approach, rather than a straight from birth-to-death structure, the book&apos;s chapters take a myth or viewpoint of Hogan and break down its accuracy and veracity. More often than not, Hogan&apos;s personality traits are defended and explained because of an event or circumstance of Hogan&apos;s life, such as the suicide of his father when he was 9. The book is heavily annotated, revealing Scott has done a lot of research of existing material, and he received input from his Ben Hogan Co. colleagues. The familiar Hogan events are here, but there are enough new anecdotes and reflections on the man&apos;s character that it makes this a good addition to the Hogan biographical well. I particularly liked: The background details of Hogan at work in his equipment company and how the ebbs and flows of the business affected him and him it. To learn that Hogan was not a fan of cavity-back clubs, which are the duffer&apos;s best chance to lessen the affect of mis-hit shots, was disappointing in that he didn&apos;t want to cut the high-handicapper some slack. Seemingly his own high playing standards got in the way. Ultimately, though, his insistence on certain production elements of the Edge model, for instance, paid off handsomely.